Authors: Nick Rumbaugh, Yue Shen, Eric Morganson et al. First Author’s Institution: National Center for Supercomputing Applications, IL. Active galactic nuclei (AGNs), the central active regions of supermassive black holes, have many masks. They span a large range of luminosities from roughly ten billion to ten thousand Milky Ways (even at their dimmest, they are still one of the brightest objects in the Universe). They have varying radio brightnesses and the presence of radio jets is not a luxury to be had by all. When scrutinized with a spectrograph, they reveal telltale signs of different anatomies. Some exhibit broad emission lines, others narrow, and still others both. Therefore, AGNs carry a myriad of different names, such as Seyferts, blazars, and quasars. However, the multifaceted appearances of AGNs are deceiving — the AGN unification theory postulates that which type of AGN you see depends on your viewing angle and the wavelength of light you’re looking in. Otherwise, you’re simply looking at one and the same object, the central bright region of a supermassive black hole. All AGNs have one thing in common: they vary in brightness. In (not quite) the (exact) words of Shakespeare, an AGN by any other name would always vary. In particular, quasars (the highest redshift and most luminous subclass of AGN and the main focus of the paper) are known to vary by 10%-30%, corresponding to ~0.1 mag to ~0.3 mag, over the course of many years. The physical mechanism for their variability is still an open question, with the leading theory being temperature fluctuations in the black hole accretion disk driven by an X-ray source near the central black hole. 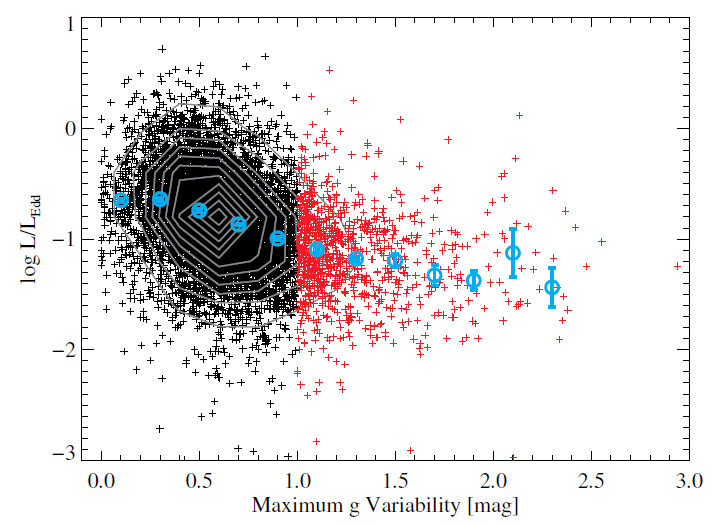 The authors of this paper are not interested in regular varying quasars, instead they are interested in quasars that vary by 1 magnitude or more — the extreme variability quasars. There is a hint of such a population from previous studies, such as a joint PanStarrs-SDSS search that uncovered ~40 quasars that vary by more than 1.5 magnitudes. Extreme variability quasars are thought to be the larger class of an intriguing group of quasars that has only recently been discovered (oh no, not another group), known as changing look quasars (see this for an example). Changing look quasars pose a significant challenge to the AGN unification model, because they change from one AGN type to another over the course of several decades. More often than not, these changes are accompanied by a large magnitude variation. Aside from studying the properties of the extreme variability quasars, the authors also hope to build a larger sample of changing look quasars in order to probe their origin(s). 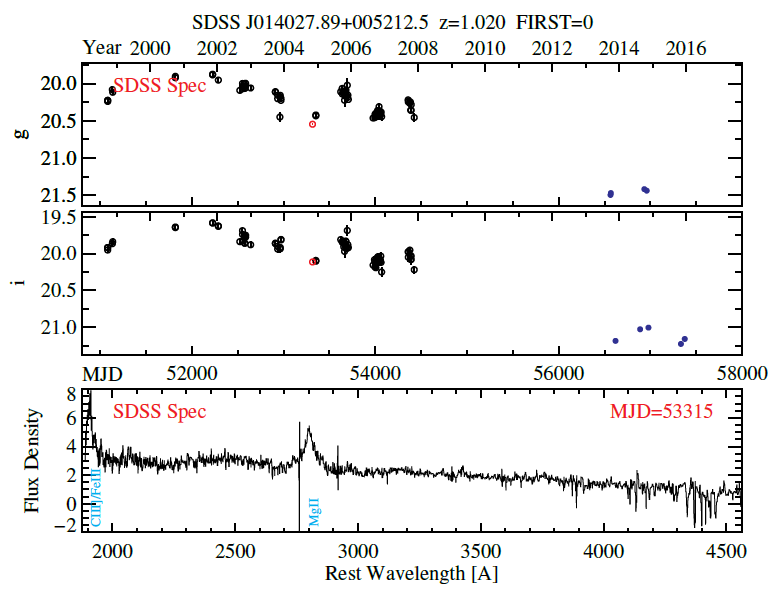 Using both SDSS and the Dark Energy Survey (DES) to construct a search baseline of ~15 years, the authors found ~1000 spectroscopically confirmed quasars that vary by 1 magnitude or more. They also recovered all previously known changing look quasars that fall within their footprint. Figure 1 shows the light curves and spectrum for one of their objects. In addition to finding that extreme variability quasars have stronger emission line strengths compared to regular quasars with similar redshifts and luminosities, their Eddington ratios are also lower. The Eddington ratio is a ratio of the quasar luminosity, which depends on the accretion rate, to the Eddington luminosity, which is the theoretical maximum luminosity. Figure 2 shows the relation between the maximum variability of the extreme variability quasars and their Eddington ratios. There is a trend of decreasing Eddington ratios with variability, leading to the interpretation that the extreme variabilities are connected to the Eddington ratios. By extension, the authors attribute the reason changing-look quasars change types to their varying accretion rates caused by internal accretion disk processes. Using a simple model, the authors estimated the intrinsic fraction of extreme variability quasars to be between ~30-50%, which is much higher than the observed fraction of 10%. With more frequent searches over a wider area and longer period, we should discover more of these exotic objects to help shed light on the physical mechanism of quasar variability and the phenomena of the quasar population as a whole. I am a third year PhD student at the Department of Astronomy at The Ohio State University. I am currently working on quantitative analyses of various quasar selection methods using the Dark Energy Survey (DES) and quasar variability via microlensing.